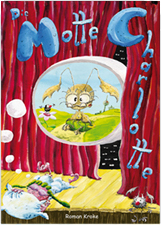 The picture story Mottie the Moth is published in a GERMAN edition (= Die Motte Charlotte) . A translation of the story as well as a vocabulary booklet are available as a FREE PDF-Download in the following languages: English, French, Spanish, Italian. Köstlicher Lese- und Bilderschmaus – nicht nur für Berliner!